Obtaining a Certificate of Title by conducting a St George title search is recommended and/or required in numerous situations, such as when refinancing a mortgage, when proving ownership, when selling or buying property, and more. A Certificate of Title (CT) is a record of land ownership. It includes legal and public information concerning restrictions and interests on the land, like lease and mortgage details, names of property owners, and much more property information. For the most part, CTs are acquired electronically today in conjunction with a St George title search. 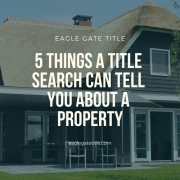 Of all the things that a St George title search can show you about a property, here 5 of the most important. All land owners are listed on a property title by name. Some properties have multiple owners in which case the St George title search would reveal either joint tenants or tenants in common. In the case of joint tenants, if one passes away, the other retains full ownership. In the case of tenants in common, a portion of the land is owned by a person who has the option to leave their share of the property to someone in a will or simply sell it. An easement is when a property owner gives specific property rights to someone who doesn’t have ownership, such as for right of way or services. If you need city workers to have the ability to service a piece of city property -such as an electrical pole – that resides on your property, an easement would be arranged. This is an example of a service easement. If a neighbor or service worker needed to cross your property to access something on the other side – such as a road or electricity infrastructure – this is when a right of way easement would come into play. 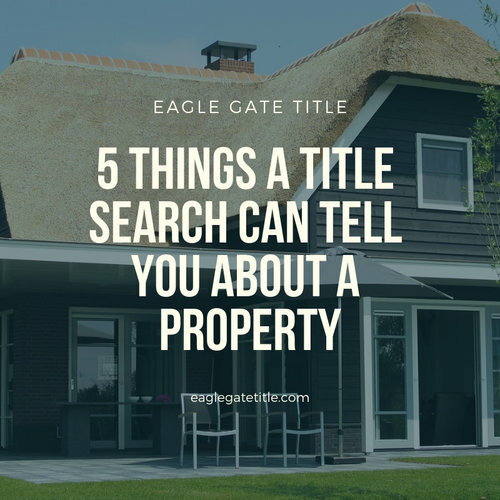 A St George title search can reveal preexisting easements that a property may have, which in some cases could prevent or hinder certain uses of the land if not discovered and addressed. St George title searches also disclose covenants which are land restrictions and guidelines that can put limits on certain aspects of property use, such as materials that must or cannot be used in construction, or what can or cannot be built on it. Property developers create covenants to retain the feel, look, and quality of a neighborhood or building. Types of covenants include those that limit the number or type of structures that can be built on a property, as well as specifying paint colors that must or cannot be used on a home, or limits on driveway size, things like that. Obviously, a person would want to know if such limitations existed on a property they were considering purchasing. In some scenarios, another person who claims that all or part of the property rightfully belongs to them may have expressed official interest in the property, which shows up in a St George title search as a warning in the form of a legal notice that the person would have lodged with the state land registry. This is called a caveat. In a situation where a St George title search brings up a caveat, the existing owner is prevented from selling. Caveats can be lodged by builders who are owed money, relatives or heirs of existing or previous owners. Caveats will not clear the title, as expected. The Certificate of Title is held by the bank, not the property owner, if the property has a mortgage on it. In this case, the St George title search will show the lender listed on the title. This can delay the purchasing process as the mortgage must be discharged by the seller before going forward.